What Should We Add Next To The Techdirt Gear Store? Right now, there are four different designs in available in the Techdirt Gear store on Teespring: our new Copymouse gear, our limited-time I Invented Email gear, and two different styles of Techdirt logo gear. But, under Teespring’s new ongoing-order system, over time we’re going to start bringing back some of our designs from last year as permanent fixtures in the store — in some cases with tweaked or updated designs. 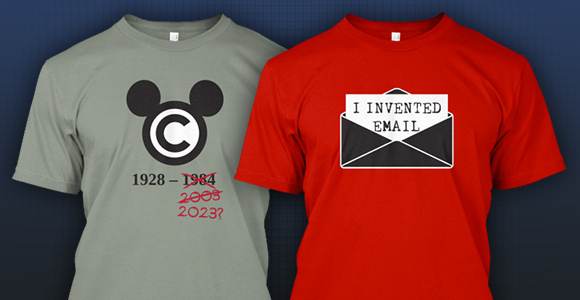 So, which Techdirt tees would our readers like to see first? There’s our popular Takedown gear, the controversial Copying Is Not Theft, and some less-popular but beloved-by-some options like Home Cooking Is Killing Restaurants and Math Is Not A Crime. Of course, there’s also the first t-shirt we offered and still the most popular: Nerd Harder. We have some brand new designs in the works too and will be rolling those out in the near future, but first we want to get one or two of these classics back into rotation. In addition to letting us know which ones you’re most interested in, feel free to include your thoughts on whether the design needs an update or you’d like to see different products/colors available! Thanks for your feedback, and thanks for supporting Techdirt.